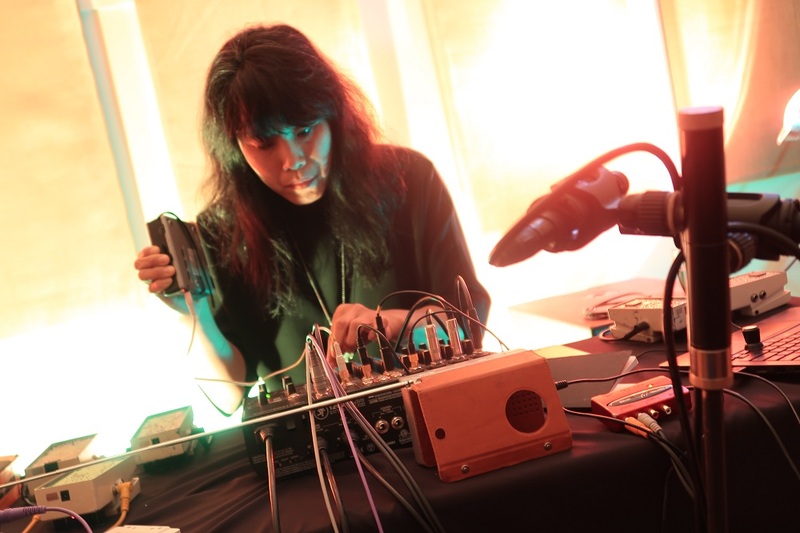 Bonnie Jones is an electronic musician, sound artist and poet. 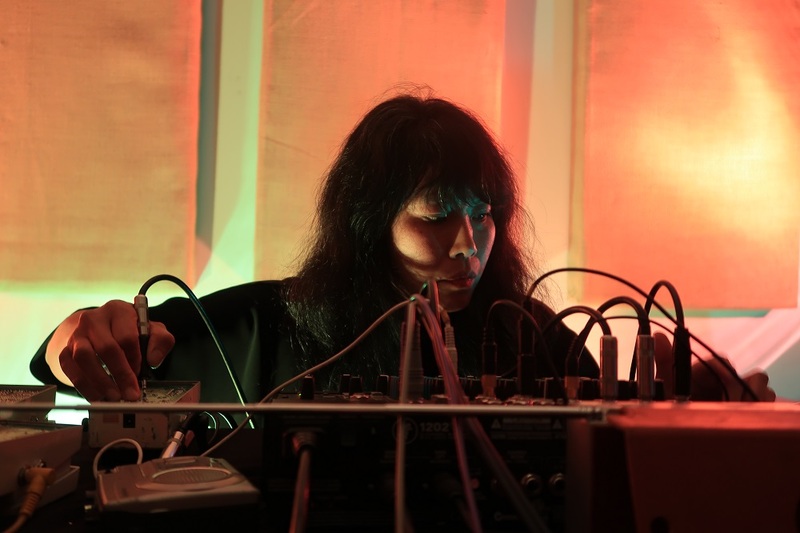 She works with circuit bent instruments, radios, sine tones, and other non-traditional electronic sound. Excerpt, solo electronics improvisation. Circuit bent electronics, sine tones, samples, and microphones. ESS, Chicago, IL, May 2018.
we listen, how we remember. Performance installation, Excerpt, August 2016. Excerpt, we listen, how we remember. Performance installation. History, sine tones, samples, objects, moving bodies. Walters Art Museum, Baltimore, MD, August 2016. Excerpt, Improvised music. 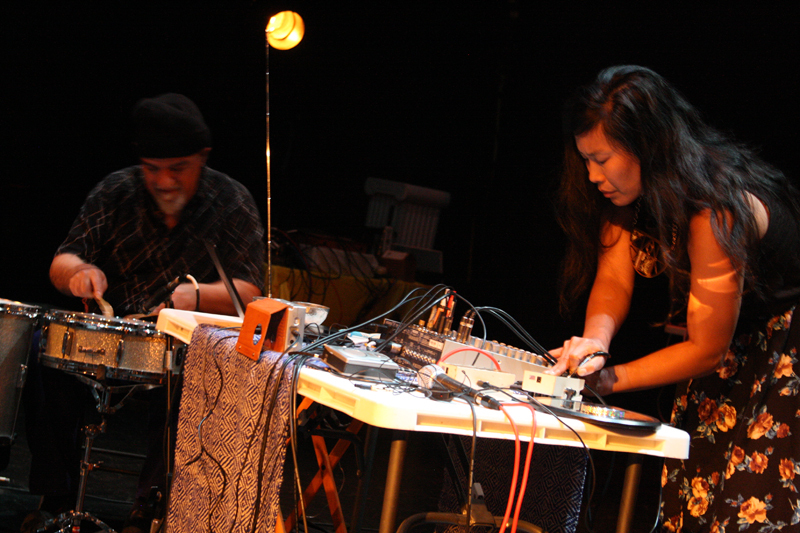 Bonnie Jones, electronics and Michael Zerang, percussion. High Zero Festival, Baltimore, MD, September 2015. Video documentation of improvised electronic solo performed for Ken Vandermark's Options series at Experimental Sound Studio in Chicago, IL, May 2018. This short piece shows the expressive range of the circuit bent digital delay pedals that I've been working with for over a decade. Solo electronics improvisation. Circuit bent electronics, sine tones, samples, and microphones. ESS, Chicago, IL, May 2018. A performance installation for the Walters Art Museum in the 3rd Floor Galleries of Migration Art, Byzantine, and Pre-Medieval objects. The piece beging with a text, a meditation on objects and their ability to hold and structure history. Various rooms of the galleries have objects acting as speakers, with samples or tones playing through the object. The sine tones or pure tones are selected to establish tritones (diminished fifths) or what during the Renaissance was referred to as the "Devil's Interval" for is dissonant character. Careful selection and placement of samples are designed to foreground the literal museum space, for instance the sounds of industrial heating/cooling systems are played back into the space, in addition to evoking communication and connection through time by using shortwave radio samples and electronics. Performance installation. History, sine tones, samples, objects, moving bodies. Walters Art Museum, Baltimore, MD, August 2016. A first time meeting of accomplished improviser Michael Zerang, percussion and Bonnie Jones, electronics at the High Zero Festival of Experimental and Improvised Music. This 30 minute set explores the dynamic range of timbres and textures of circuit bent electronics and percussion. Improvised music collaboration. Bonnie Jones, electronics and Michael Zerang, percussion. High Zero Festival, Baltimore, MD, September 2015. Documentation of a live performance of "the p in pattern", a sound / text composition that uses live and recorded electronics, vocals, and text to create a distinctive sonic space where language and sound slip between visibility and invisibility. 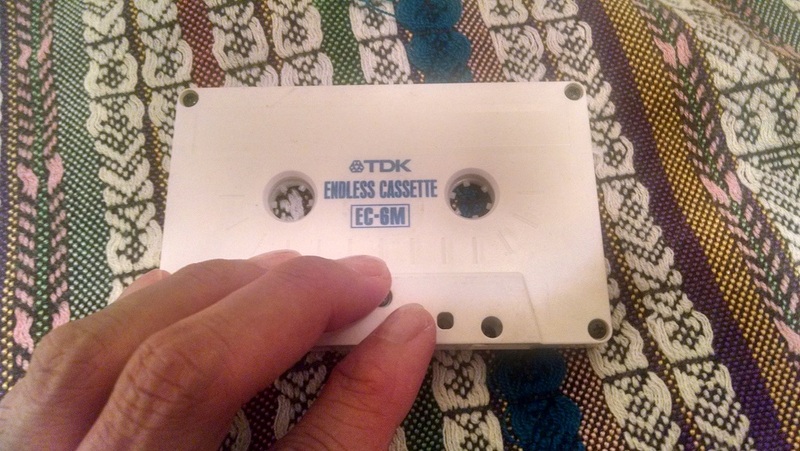 This conceptual cassette sound work is constructed by manipulating in live performances a cassette player and a TDK EC-6M 6 minute looping cassette tape. The cassette player is used during the performance to create feedback by indiscriminately pressing the player’s controls (record, stop, forward, rewind). These six minutes are a recombinant document of numerous live performances over the past several years where I recorded, re-recorded, and erased the sounds of audio tape feedback, myself and other musicians. This work was commissioned for Evening Will Come: A Monthly Journal of Poetics, October 2015. Conceptual cassette sound work. Electronics, cassette, feedback. Constructed from several live performances, October 2015. "by the time" was commissioned by the London ICA as part of their "Soundworks" exhibition, launched in conjunction with their presentation of Bruce Nauman's "Days." The work explores language and meaning through time and space, using electronics and field recordings. It present the paradox at the heart of sound, that ephemerality is also deeply embedded in our memories and bodies. Installation view, sound works are selected from embedded screen and played back through speakers in the room. by the time. Electronics, samples, field recordings. Soundworks, London Institute of Contemporary Art, June 2012. Sound work. Electronics, samples, field recordings. Soundworks, London Institute of Contemporary Art, June 2012. A longstanding musical relationship that formed in 2006 at the Seattle Improvised Music Festival. Andrea Neumann is an improviser and pianist, the innovator of "inside piano", an instrument that consists only of the strings, its resonance board and the cast-iron frame. The duo has toured extensively in the US, Europe, and Mexico, and in 2012 released "green just as I could see" on Erstwhile Records. 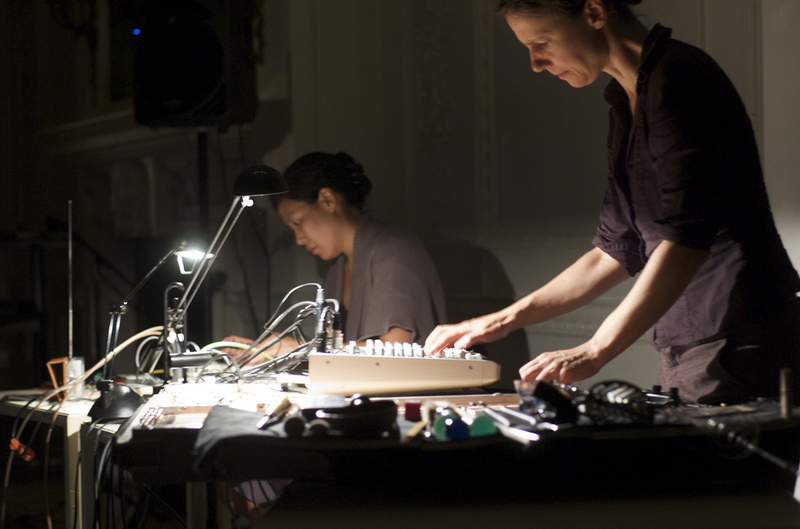 Belle Reed, Improvised Music, Bonnie Jones, electronics and Andrea Neumann, mixing desk, inside piano. Erstwhile Records, April 2012.